Submission to the FDA regarding e-cigarette "deeming regulations"
A nationally representative survey over 36,000 adults in 2014 showed that one-eighth of all Americans had tried an e-cigarette (a nicotine vapor created from heated liquid rather than tobacco) at least once in their lifetime. Nearly 48 percent of current smokers and 55.4 percent of recent former smokers had tried an e-cigarette, while 8.9 percent of long-term former smokers and 3.2 percent of adults who claim to have never smoked cigarettes had tried e-cigarettes. Current smokers who had tried to quit in the past year were almost twice as likely to be current users of e-cigarettes compared with smokers who had not tried to quit. The data suggest that this "vaping" is associated with quit attempts but one of the paper's authors, Charlotte Schoenborn, MPH, told Medscape (login required) "I don't think we can say that current and recent former smokers as well as smokers who have tried to recently quit are using e-cigarettes to help them quit smoking we can't get that directly from the data...but that is something we need to be looking at over time." These data suggest that electronic cigarettes are associated with smokers making quit attempts. Since 22 percent of recent former smokers are current e-cigarette users, it appears that electronic cigarettes have played a major role in smoking cessation for nearly one-fourth of this population of recent quitters. In 2014, the number of Americans who smoke dropped below 40 million for the first time in the 50 years that the National Health Interview Survey has provided smoking statistics but the prevalence of former smoking was relatively stable for men and women in all years. 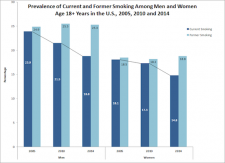 That means the declines in current smoking are likely a reflection of the increasing percentage of Americans who have never smoked and the long decline in uptake by teenagers. Since former smoking is stable but e-cigarette use has gone up, they don't cause people to quit, but they likely do reduce harm while the American Council on Science and Health continues to advocate for quitting cigarettes altogether.